When I was starting with Rails, there were several “AHA!” moments that made me think I had been wasting my life as a .NET developer. Gems, rake, Active Record, and the list goes on. One of these moments came years later in the form of Heroku. Heroku is a deployment platform for Ruby and Node.js based web applications. There are many “getting started” articles with Heroku, one of the best is Ben Scofield’s which I recommend you read before going any further in this article. Ben does a great job showing you how to get an app up on Heroku, along with detailing some of the constraints of the Heroku platform. By the end of that article, you should see how crazy simple it is to get a Rails up on web. In this article, I plan to take the Heroku deployment scenario a step further, and show you how to have a development/staging app along with a production app. When you are creating applications for clients/friends/your cat, it’s a good idea to have a “staging” application to test changes to the app and allow the end users to see it before you apply anything to production. You can test new gem versions or layout changes and get sign-off without hurting the money-making part of the site. The issue when you have a staging area is making it simple to administer, so you don’t have to juggle multiple code bases, copy source trees, etc. Heroku makes this a breeze. 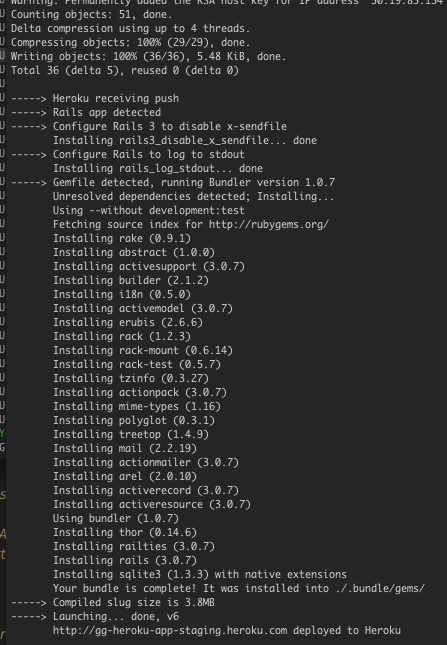 I encourage you to use RVM when investigating anything Ruby. Enough chit-chat, let’s get to the code. If all is well, you should see the standard “Welcome to Rails” page. Now, let’s get this application under source control. Another great side-effect of using Heroku is it forces you to use source control. git commit -m "Initial repo commit"
Excellent, now we have a local git repository. Since this app is going to change the world, we will need some collaborators. The best way to make collaboration easy is to use GitHub. GitHub makes forking (which is, basically, copying the repository) a mouse-click and pull requests (which is git’s way of saying “Hey, I have a patch for you”) dead simple. Also, adding a GitHub repository for your app gives you an offsite copy of that is not tied to your deployment platform. Login to your GitHub account and create a new repository. Rocking. Now our app is safe and we are exercising good coding practices. Yay us! and then generate a layout and scaffold. Note: If you are having issues with Rake, please make sure either 0.8.7 or 0.9.1 is installed. Either one should get you through this tutorial. Start up our local Rails server, and we can add Scouts. We have a ton of local changes that we need to push to our various repositories. First, we’ll want to push to GitHub, so our collaborators can start working on our scout API. git commit -m "Added layout and Scout scaffold"
Of course, we need to update staging as well. Before we can start adding Scouts in staging, we need to migrate our staging database. As you might have guessed, we leverage the Heroku CLI. and we can add scouts! Our last step here is to create our production environment on Heroku. It’s simply a matter of running the ‘heroku create’ command again, giving our heroku app a different name and creating a ‘production’ git remote. And voila! You now have a production environment and a happy client! There are other resources for this approach on Heroku, one of which comes from the Heroku site itself. It is certainly worth a read, as it mentions some aspects of multiple enviornments that we don’t cover here. Also, there is gem called heroku_san which handles a lot of the details we went through in this post for you, that you should check out, now that you know some of what it does.